Garrett and I made the most of a leisurely Friday afternoon by visiting Taqueria Alvarez on Adams, not too far from our respective homes at the Village Green. I have driven by Alvarez before and was enticed by its old-timey looking sign, but when we arrived I was surprised to see the lightbox sign missing and a vinyl banner claiming “GRAND OPENING”. New management? Things started out rocky. After a harrowing bike ride up La Brea, we arrived to find the signage in chaos! They did not have Mexican Coke, and they were out of al pastor! Then we waited a long time to be served! But it turned out fine. It was a beautiful day for standing around outside a taqueria; I enjoyed a Jarritos Mandarina; and settled for a chicken taco, which turned out to be quite pleasing. Alvarez has a pleasant (if you like sitting at outdoor tables near a boulevard while traffic drives by, as I do) outdoor dining area. As Garrett pointed out, the fact that it is depressed a few inches from the surrounding pavement makes it feel like its own outdoor room. I had three tacos, one each of carne asada, carnitas, and chicken. They were quite large – second largest so far this year – and $1.85 each. Three of them left me feeling bloato (in a good way). I started with the chicken taco. I noticed effective bilaminated tortillas, above average in size and with good sturdy feel to the mouth and fingers. There was a ton of marinated dark meat chicken chunks, and a lot of fairly spicy and good tasting salsa. The chicken was reminiscent, and I mean this in the most complimentary way, of the chicken served in tacos and burritos at Del Taco. I had the thought that this chicken would make for a fine burrito; but nay, I know better, because Garrett had a chicken burrito (the meat-rice-beans-salsa affair) and found it good but somewhat lacking in chickeny-ness. The taco was abundantly chickeny, so there you have it, chicken lovers – go for the taco. Next I moved on to the carne asada taco. Heaping with meat that was a nice dark color and cut into appropriate small bits and with ideal texture, this taco was handsome. I took the first bite and was struck by winning flavors – first a slight buttery/fatty flavor, then salty, then the flavors of carne asada seasoning. The red salsa was fine. This taco was quite good. For once I can be certain it’s not just me, because a woman dining at the next table struck up conversation with us, telling us it was her first visit to Alvarez and she loved her carne asada burrito. Finally, the carnitas taco, which was also good. A few weeks ago after going to Don Jorge, I was on the brink of renouncing carnitas tacos altogether in favor of guts, but I am back from the brink. Fine taco carnitas twice in a row, so carnitas and I are on friendly terms again (when will I find the time (or courage) for tasting tacos made from guts and tongues?). The carnitas at Alvarez had that quality of contrasting texture between tender bits and dry almost-crunchy-ish bits that is the hallmark of a worthy carnitas. There was a ton of it on my taco, and a ton of salsa as well, as you see in the picture. The meat was good, with excellent tooth feel, and a bit gamy in a good way. The flavor of the meat was mild, and I was glad for lots of tasty spicy salsa. 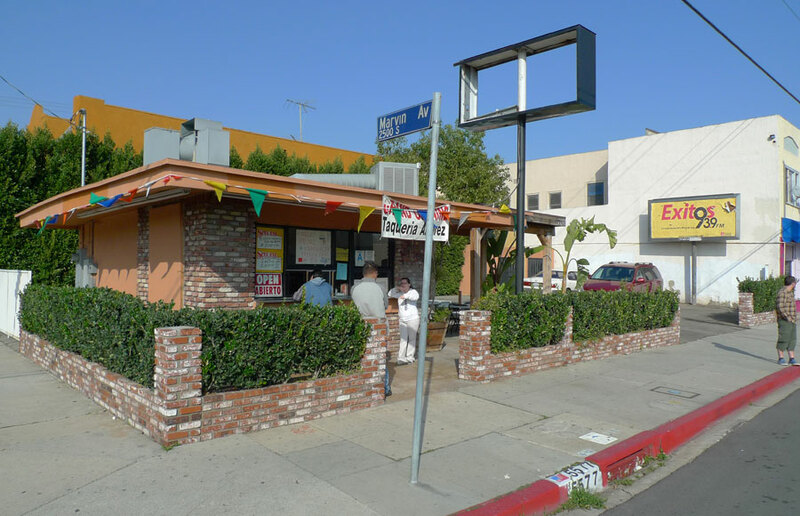 It’s counterproductive to the cincuenta taquerias project to return to local favorites for comforting tacos, rather than explore new venues to add to the roster; but I suspect I’ll be back to Alvarez a few times in 2010 nevertheless. Such dalliances cannot be avoided. I went there today with a big group including Garrett, Kirsten, Jason and Branden. Today’s visit was distinguished by slow service (we basically ordered and were served serially rather than in parallel) and by their having al pastor this time. The tacos were quite large once again. 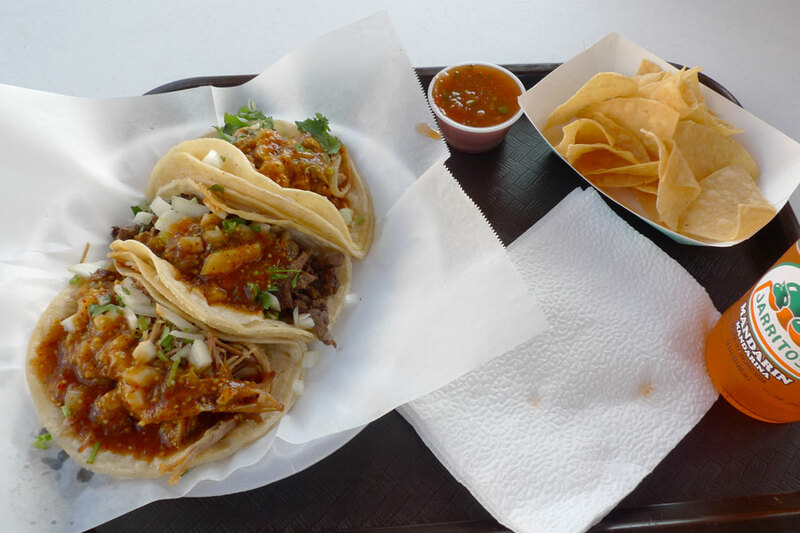 The carnitas was not as good as last time, with less fried-textured character. The al pastor was very good, featuring charred bits and tons of flavor – it is from the saucy-savory school of al pastor preparation, and reminded me of the al pastor at my beloved Cemitas Poblanas truck (Angelica’s). The asada burrito had much more flavor than the chicken burrito of our first trip to Alvarez. At first I thought the beef was creamy. After a couple bites I spotted a slight amount of shredded cheese. Since it is not listed on the menu with cheese, I assume the burrito was automatically “upgraded”. While I was very grateful for the cheese bonus, purists may want to ask for beans, rice, cilantro, and onions only.